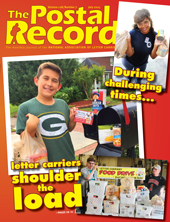 From the June 2015 Postal Record: The annual food drive of the National Association of Letter Carriers (NALC) collected almost 71 million pounds of food to help restock food banks, pantries and shelters around the country, an impressive result made all the more necessary by the extreme weather experienced by much of the country, along with the economic struggles many Americans face. The effort on Saturday, May 9, gathered 70.6 million pounds of food, marking a dozen consecutive years in which the NALC drive has surpassed 70 million pounds of food collected. Several local NALC branches still are compiling their figures. This year’s results bring the total to more than 1.4 billion pounds since the drive began in 1992. The nation’s largest single-day food drive, the NALC effort is held annually on the second Saturday in May in 10,000 cities and towns in all 50 states, the District of Columbia, Puerto Rico, the Virgin Islands and Guam. From major metropolitan areas to small rural towns, residents put out on that day non-perishable food donations that letter carriers collect as they deliver mail along their postal routes. Hunger affects about 49 million people around the country, including millions of children, senior citizens and military veterans. Far too many people remain unemployed or underemployed and need food assistance, and so pantry shelves filled up through winter-holiday generosity often are bare by late spring. And with most school meal programs suspended during summer months, millions of children must find alternate sources of nutrition. Rolando praised the contributions of the various organizations that helped the nation’s active and retired letter carriers in the food drive. Carriers brought the food to local food banks, pantries or shelters, including many affiliated with Feeding America, which was a national partner in the drive, as were the U.S. Postal Service, National Rural Letter Carriers’ Association, the AFL-CIO, United Way Worldwide, Valpak and Valassis.